Photograph courtesy of Michael Barton’s The Dispersal of Darwin blog, https://thedispersalofdarwin.wordpress.com/. Over the Labor Day weekend, I was visiting a used bookstore in Jackson, California, which happened to be having a sale. 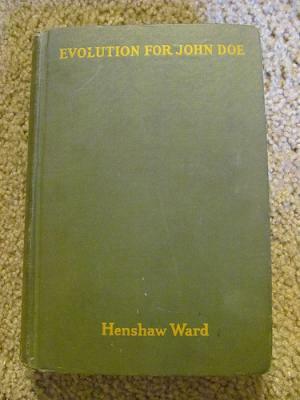 The sale induced me to buy a copy of Henshaw Ward’s popular exposition of evolution Evolution for John Doe (1925). John Doe, of course, is a common placeholder name in legal documents in the United States: Ward might have aimed his book at Joe Bloggs or John Q. Public or Joe Sixpack. But who was Henshaw Ward? According to the brief obituary in The New York Times for October 9, 1935, Charles Henshaw Ward was born in Norfolk, Nebraska, in 1872. After attending Pomona College and Yale University, where he earned a master’s degree in 1899, Ward taught English in the Thacher School in Ojai, California, and then at the Taft School in Watertown, Connecticut, from 1903 to 1922. He taught at the University of California, Berkeley after leaving the Taft School, according to the obituary; it’s not clear to me in what capacity, although I found evidence that he was teaching a summer session class to English teachers in 1924. He died in 1935. John Doe thinks that evolution explains the origin of life. John Doe thinks that evolution has something to do with “progress”—that it announces some creed of an onward and upward movement toward perfection. To the mind of John Doe, there is something mystical and awesome about “Evolution,” especially if it is printed with a large E.
John Doe guesses that evolution is true, but he rather wishes it were not. John Doe suspects from head-lines in his newspaper that evolution is a debatable theory, that it is being overthrown every six months, and that it may be discarded before long. Mr. Doe supposes that evolution is extremely difficult, so that he has small chance of ever finding out about it. (All these sentences appear verbatim in the book, but not in a bulleted list as above.) Ward not only lists these misconceptions, but also explains how Evolution for John Doe attempts to defuse them. I intend to work through Ward’s list, starting in part 2.